As exciting as it can be to crack open a beer, there's nothing fun about wandering around a party and asking other partygoers for a bottle opener. Don't worry, we've got you covered: here are 10 crazy ways to get to drinking while impressing your friends with your ingenuity. Some require some pretty hefty feats of strength, so try at your own discretion. Soup spoon, dinner spoon, bartending spoon—any spoon you can find can get your beer open. As professional bartender Moe Harris explains, just grip your bottle tightly, position the edge of the spoon beneath the bottle cap, place your finger over the cap, and push the spoon downward. The angle of the spoon's edge will pry the cap upwards and off, sending it flying far from your beer. Take a tip from Chow and crack open your beer with a single sheet of paper. That's right—just one flimsy piece of paper can give you enough leverage to get that stubborn cap off. Fold the paper in half repeatedly until you're left with a thick rectangle. Position your piece of paper beneath the bottle cap's edge, and force it upwards and away from your beer. This last-minute lever does require a strong hand, but can get the job done in seconds. Not every shoe will get your beer open, but a single high heel can. Tipsy Bartender explains that the pointy heel is an excellent lever—provided you don't mess up your heel in the process. As you hold the shoe with its toes pointed to the ceiling, position the rubber-capped tip of the high heeled shoe in the space beneath the beer bottle's cap. Put your finger under the tip to hold it in place, and push the bottom of the shoe down to push the cap's edge up for a creative, last-second lever. Don't want to spend precious seconds struggling? Get violent with your beer, and use a saber get the bottle open. 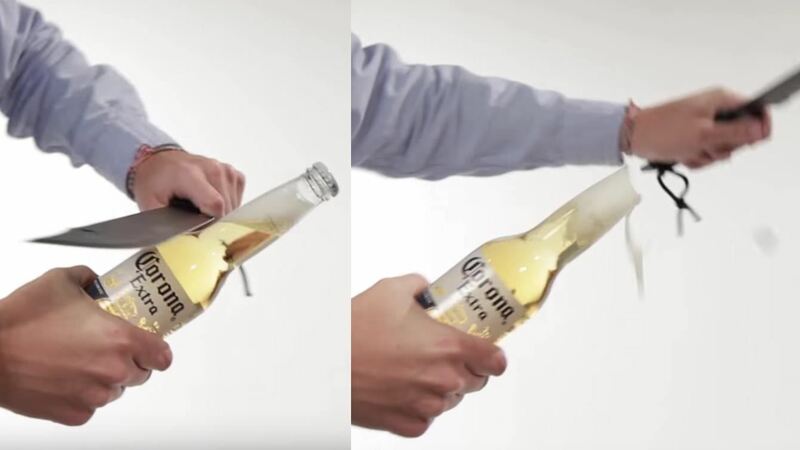 BuzzFeed shows that a machete—or a traditional champagne saber, if that's more your style—can eliminate all your beer bottle woes in seconds. Practice your sabering swings, and, when you're ready, hold the beer bottle away from you and slice the cap off with a single strong swing of the blade. It can be a messy method, so we recommend only sabering outdoors. If there's one bottle of beer at your party or in your fridge, chances are there's at least one more around for other thirsty drinkers (if you're a good host, that is). If you're lacking an opener, a second bottle of beer can help, as Travel Adventures demonstrates. Use the beer caps against themselves to get your bottle open. Stand the bottle you want to open upright, and flip the other upside down, sliding the corner of its cap underneath the edges of your bottle's cap. Wrap two fingers and your thumb strongly around the upside down bottle to keep it in place, while also holding the neck of the bottle you want to open in your hand. 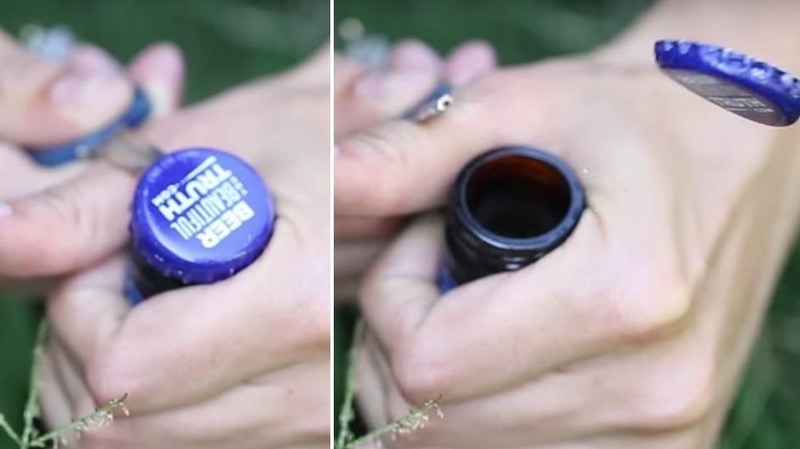 Push the upside-down bottle away from you to apply upward pressure on the bottle cap, and it should pop off. Be careful with this method, though, as one quick slip of your hand can break not just one, but possibly both of the beers. 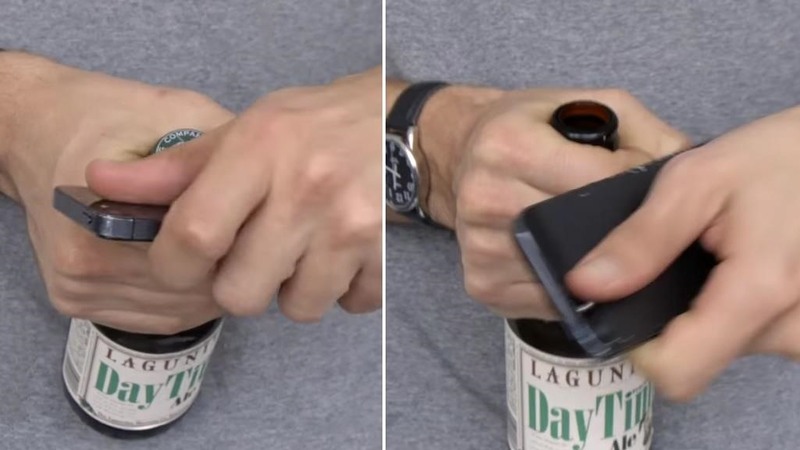 Another handy way is to crack your beer open with a lighter—just a regular ol' cigarette lighter, as Howcast shows. Use the non-lighting end of any lighter as a lever, placing its edge right beneath the bottle cap and holding it in place with your finger. Push the far end of the lighter down to pry the cap up and off... then enjoy your hard-earned beer. You don't have to get desperate with your beer if there are scissors nearby. Instead, use a pair to wiggle or pop off the cap by positioning the closed blades beneath the cap, as The Beer Proping Hd demonstrates. Like so many of the other methods, this trick is all about creating leverage to pry the cap up and off . As you "wedge" the scissor blades beneath the edges of the bottle cap, secure it with your thumb and twist the blades toward you to pry the cap loose. Stick with one side, or attack both, and the cap should pop right off. Thanks to its flat and thick sides, the older iPhones helps you create the perfect leverage to get that bottle cap off. Of course, you put your phone at risk with this trick, because it WILL scratch it—so only use this method if you don't mind any phone damage. Reach into your pocket for your keys—any traditional key can free your beer. BuzzFeed suggests a house key, but any that feature a head that you can grip and a skinny body will do the trick. Stick the edge of your key's body as far under the cap edges as possible, and get to prying; with some strength and finger force, you'll pop the cap off in no time. 10. If All Else Fails... Stick It in Your Eye? When you're completely without any tools to get the job done, you can always take your beer bottle to your eye. Yep, your face can double as a bottle opener, just like your forearm can, provided you use a strong bone that can stand up to your glass bottle. Note: Please, please, please, do not try this... If you attempt to do this, do so at your own risk. YouTube user badvboynofear demonstrates how to create some last-minute leverage by placing the beer cap at an angle against your brow bone. Ignore the pain, apply pressure, and move the bottle downward, using your brow to pop the metal cap off. If that wasn't enough for you, there are plenty of other ways to open a beer bottle without a beer bottle opener. As entertaining and creative as every one of these beer-opening hacks may be, some of them just aren't realistic if you're not incredibly strong. Even if you break a few bottles along the way, these opener tricks will provide some hilarious entertainment, some cold brews, and you might even impress someone.